The phrase “zombie mall” was coined by the American press to describe the rising phenomenon of shopping centres that are devoid of both shops and shoppers. “The lights are on, the escalators keep moving, but their purpose in life has gone,” ran a 2017 New York Times article. Sound familiar? The South African retail landscape is similarly littered with monuments to rapidly changing consumer tastes. For decades, malls have functioned as places of retail escapism, characterized by unnatural lighting, exaggerated design effects and a proliferation of fastfood outlets and international fashion brands. This era is drawing to a close. Consumer tastes are shifting dramatically away from all things synthetic and commodified, towards experiences and products that feel authentic, natural and real. Many retailers have looked inwards, and have successfully adapted to these changes, refreshing corporate identity, altering product range and experimenting with new design elements. Authentic fabrics, textures and finishes are no longer the preserve of boutique stores – they have become the new retail standard. It is a standard that consumers increasingly expect of the greater mall environment, too. Sterile walkways and pointless design elements are driving an increasing number of consumers away from malls, towards new retail initatives such as produce markets, artisan hubs, and micro-centres. Progressive mall developers and owners are realizing that in order to retain tenants and attract customers, there is a need to think like retailers, and to re-fashion public mall space with the consumer experience foremost in mind. In practice this might mean creating spaces that are naturally lit, texturally rich and conducive to social interaction. It might mean opening up lines of sight to focal points, creating natural pause areas and conceiving value additions that resonate with modern tastes, such as food experiences, live music, pop-up markets, and more. This is where celebrated retail interior design specialists TDC&Co come into their own. 23 years of retail design, materials procurement and fitout experience, working with the likes of TFG, Woolworths, Zara and Nespresso, has enabled TDC&Co to identify and bridge the gap between what landlords and architects deliver, and what retailers and consumers increasingly expect. In 2017, TDC&Co is collaborating with Hyprop to embed a new interior design and retail philosophy in their mall spaces, centred around consumer experience. The food court of the The Glen shopping mall will soon be transformed into a highly experiential environment in which people can eat and meet, pause and dwell. In many malls, the food court is a space in which brands yell at customers in neon lettering. 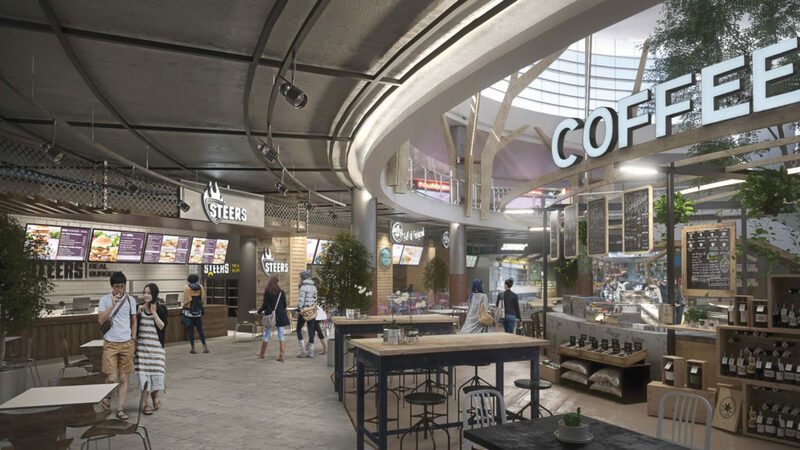 The foodcourt that TDC&Co is developing for The Glen in partnership with experienced mall architects, MDS, will be the antithesis of this – a space in which brands will add to the customer experience, co-existing harmoniously. It is no secret that the 21st century obsession with food is redefining the form and function of retail centres. Food businesses – whether grocery stores, kiosks, restaurants or fresh produce markets – are already replacing fashion retailers as the anchor tenants in many successful malls. However, in most instances the potential in food has hardly been scratched. Smaller, independent malls and centres are particularly poised to benefit. If they are able to embed food experiences that are authentic, innovative and communal, smaller players could potentially emerge from the shadow of larger competitors. On the north coast of KwaZulu-Natal, TDC&Co has been assisting the Ballito Lifestyle Centre to differentiate its identity from the big-box mall across te road. The experience of food has been central to the strategy. A largely open-air food quarter has attracted several well-loved restaurant brands, and a daily market will draw in the finest artisan food and beverage producers in the province. Traditional malls have favoured national and international brands over artisans, and have been caught out by the countercultural enthusiasm for all things organic, local and hand-crafted. By creating a sophisticated yet highly social space for these producers and their wares, Ballito Lifestyle Centre is claiming the values of community and authenticity. Working with these differentiated values, TDC&Co has been able to refresh the centre’s corporate identity, bringing it in line with current market tastes.